What is Odissi? Odissi, or Orissi, is a classical dance form from the state of Orissa. Odissi is characterized by fluidity of the upper torso (the waves of the ocean on the shores of Puri) and gracefulness in gestures and wristwork (swaying of the palms), juxtaposed with firm footwork (heartbeat of Mother Earth). All classical Indian dance forms include both pure rhythmic dances and acting or story dances. The rhythmic dances of Odissi are called batu/sthayi (foundation), pallavi (flowering), and moksha (liberation). The acting dances are called abhinaya. Although incorporating a range of emotions and mythologies, the eternal union of Radha and Krishna (Gita Govinda) is central to the abhinaya in Odissi Dance. Either Odissi or Orissi may be considered acceptable in writing. Sculptures of Odissi dancers adorn many temple walls in Orissa. 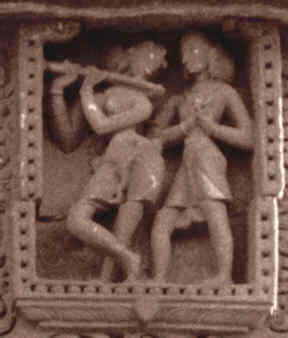 Carving of a dancer playing flute in the tribhangi position for a rapt listener (right) exemplifies the Odissi pose now associated with Lord Krishna. Be sure to check the What's New? and Dance News pages on this website for updates. This site was designed and is best viewed at 1024 by 768 pixels. © 1998-2006, David J. Capers, except where otherwise specified. visitor to this web site.